Originally called Woodard, or Woodard Station, after the family who owned the land on either side of the tracks, the district that is now Millwood was a little railroad town. The arrival of the Inland Empire Paper Company in 1910, however, changed the fate of the region. In 1909, W.A. Brazeau who was associated with the Nekoosa-Edwards Paper Company in Wisconsin was on one of his regular commutes to the Northwest. He chanced to pick up a Spokesman Review advertising land for a paper mill on the Spokane River. His interest was piqued and he was quickly able to gain the funding of his associates back east. 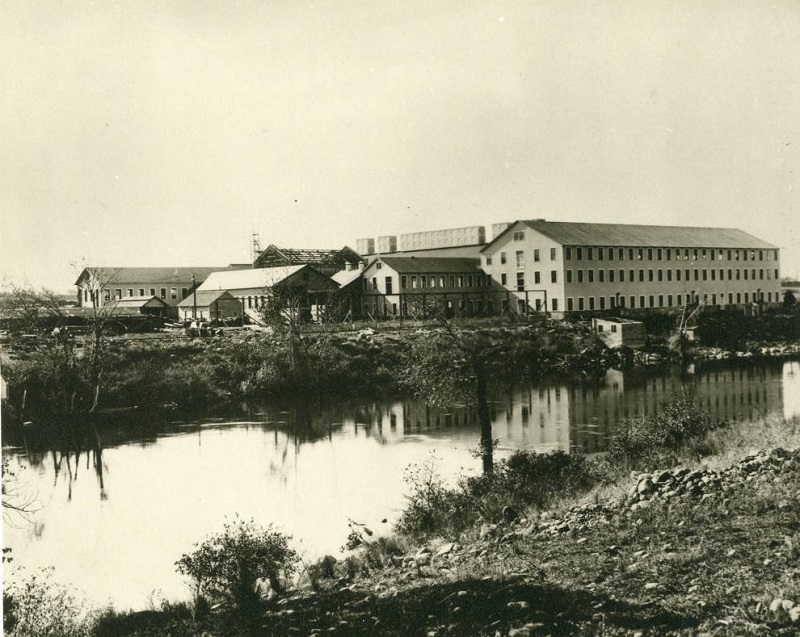 Construction of the mill began in 1910, supported by capital from Wisconsin. By 1911, Woodard had been transformed into a company town, creating a new community. The town's name was one of the first things to change. The Inland Empire Paper Company wanted to call the town Milltown, but a combination of the two names was agreed upon by the Woodard family and the company. Thus Millwood was created. 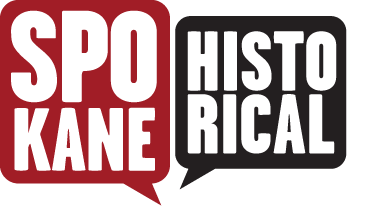 Restaurants, barbershops, and hotels were opened to meet the needs of the company's employees, many of whom were relocated from the Midwest. The paper company encouraged its employees to build homes close to the mill. The Inland Empire Paper Company bought many of the lots surrounding the mill in 1923, in response to the national "Better Homes Movement" of 1922. The company even went so far as to offer an architectural-pattern book for the employees to follow. Due to its close proximity to Spokane and other Spokane Valley settlements, Millwood never became isolated or exclusive like other company towns. Nevertheless, the mill was the very life of the town. Many social activities were centered around it. The Company built a baseball field, and put together a team every spring. The company also supported the local schools and the Presbyterian Church. A band was even formed in 1923 called the "Paper Makers Band," consisting of mill employees. In the 1960s and 70s, the town's life slowed down and many of the commercial buildings were vacant. It wasn't until the 1990s that Millwood started to regain its former glory as people who wanted to preserve the history of the town became active in the community. Today, the mill continues to produce paper. The familiar whistle blasts at seven-o-clock, noon, 1:45, and 3:45 every day, continuing the tradition. Millwood maintains a distinct community and remains the only incorporated town in the Spokane Valley. The Paper Mill in its early days, early 1900s: The Inland Empire Paper Company's paper mill was the center of Millwood's community. Image courtesy of Washington State Archives, Digital Archives. 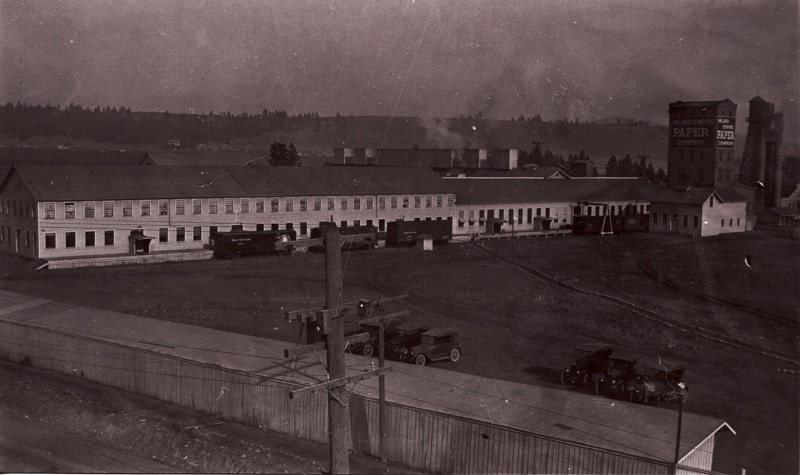 The Mill across the Spokane River, c.1912: Beginning construction in 1910, the Inland Empire Paper company quickly transformed the small town of Woodard into a company town. Image courtesy of Spokane Public Library, Spokane Valley Digital Archives. 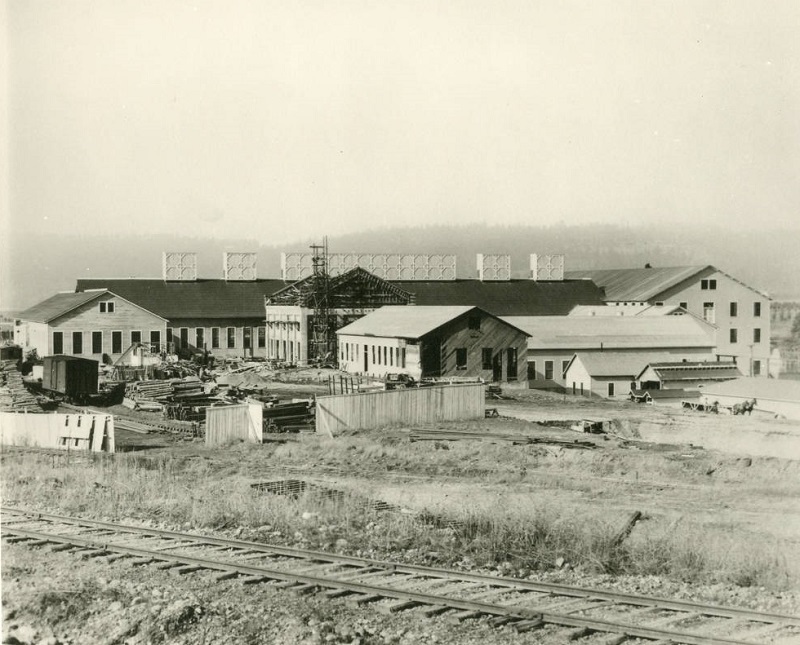 Construction of paper mill continues, c.1912: The Inland Empire Paper Company's paper mill continued to expand into the 1920s. Image courtesy of Spokane Public Library, Spokane Valley Digital Archives. 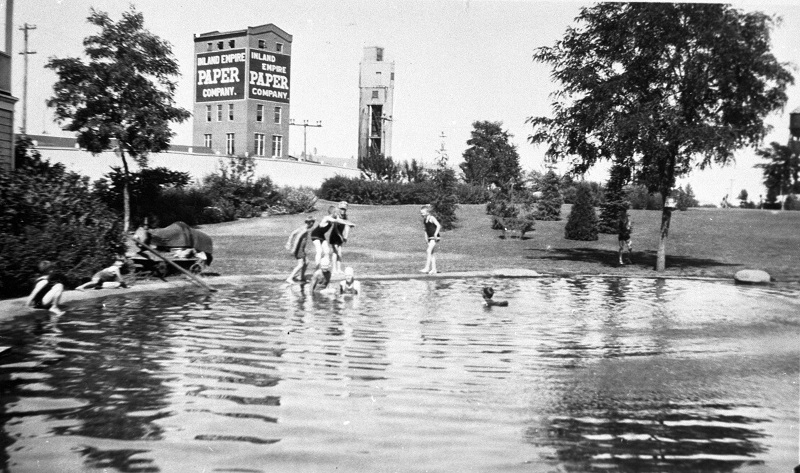 Children swimming near the paper mill, c.1920: This photograph illustrates the vital role the mill played in Millwood's everyday life and town's livelihood. Image courtesy of Washington State Archives, Digital Archives. 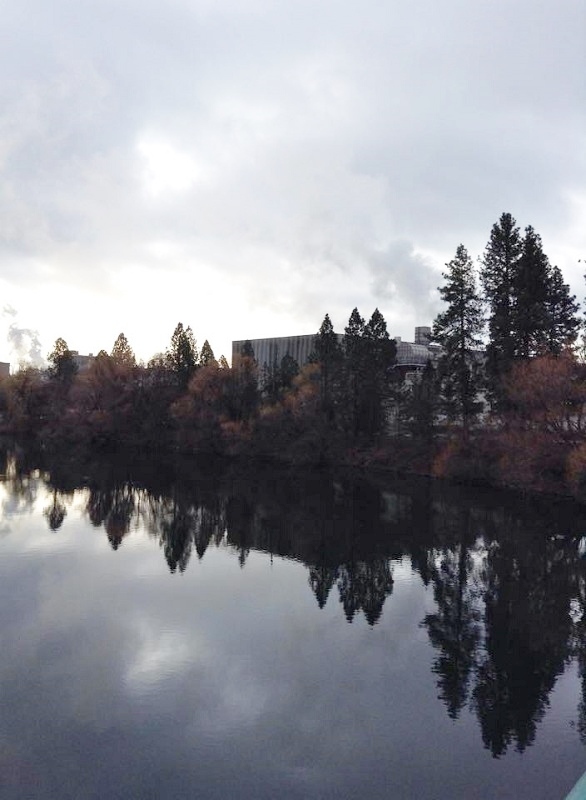 Millwood's Paper Mill, 2015: North side of the the Inland Empire Paper Company's paper mill across the beautiful Spokane River. Image photographed by Hannah Bancroft. Hannah Bancroft, “The Arrival of the Paper Mill at Woodard,” Spokane Historical, accessed April 20, 2019, https://spokanehistorical.org/items/show/545.